I never make dolma in the winter so for me, as soon as the sun begins to shine and the temperatures start to rise, the dolma-making instinct in me stirs. Of course it’s the fact that all of a sudden all the right stuffing vegetables start making their appearance in the market and after all those lentils and other winter recipes, they make a joyful change. Admittedly dolma are a bit time-consuming to make – not recommended if you’re in a hurry – but one big plus is that you can prepare them totally in advance. They keep very happily in the fridge once they’re cooked covered with clingfilm. 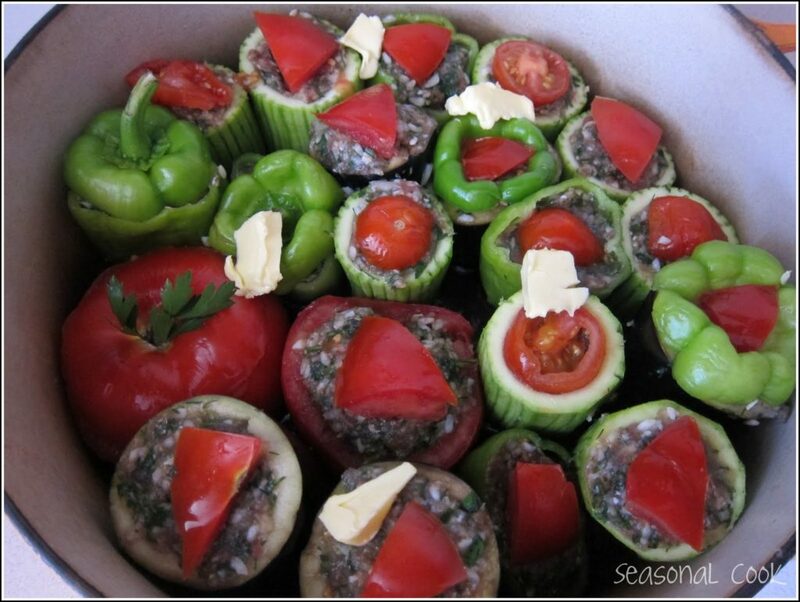 All you have to do is put them in a hot oven to give them that lovely lightly grilled look before whizzing them off to the table where the assorted colours of the different dolma combined with that inviting aroma are always a crowd-pleaser. I often make them when friends or family from abroad are due in from the airport as a Welcome to Istanbul kind of dish! Delayed flights won’t upset them unduly. An assortment of prepared tomatoes, courgettes, aubergines, and sweet green peppers. Using a teaspoon, halve and carefully hollow out the courgettes, aubergines, and *tomatoes. The tomatoes should be very firm as they tend to become soft during cooking. Carefully deseed the peppers. You don’t want to spoil their shape. Sprinkle the inside of each one lightly with salt before filling. Place all the ingredients for the stuffing except the butter in a large mixing bowl. 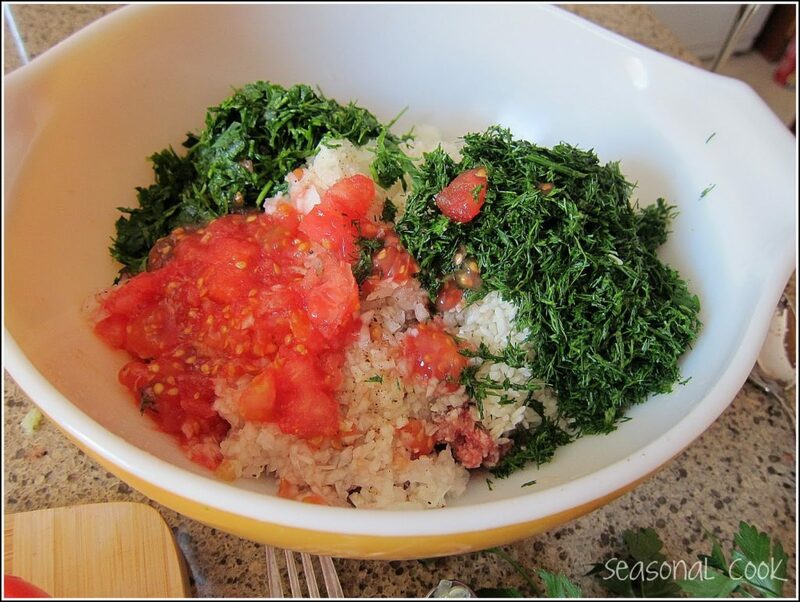 Use your food processor for the herbs and onions. Use this to fill each of your hollowed out vegetables to the top, not too tightly and not over-full. Remember the rice will swell. Top each one with a little decorative slice of tomato or green pepper. Place them one by one in a single layer in a heavy casserole. Le Creuset is ideal. Make sure they stay upright. Pour in the water, add a few knobs of butter, half cover and cook on medium heat for about 1 hour. If you have any of the meat stuffing left over, make little meatballs and place them on top of the dolma. If you prefer a slightly firmer dolma, after cooking, arrange in a single layer in an ovenproof dish with some of the liquid around, and place in a preheated oven(350°F/180°C) until lightly browned (about 20-30 mins). *If you use tomatoes, add the hollowed out insides to your stuffing mixture. This was a tip from my MIL! Not only does it add to the taste, but it keeps the stuffing moist during cooking. Wedge the tomatoes against the side of the pan with other dolma firmly against them. This helps prevent total collapse and loss of shape! 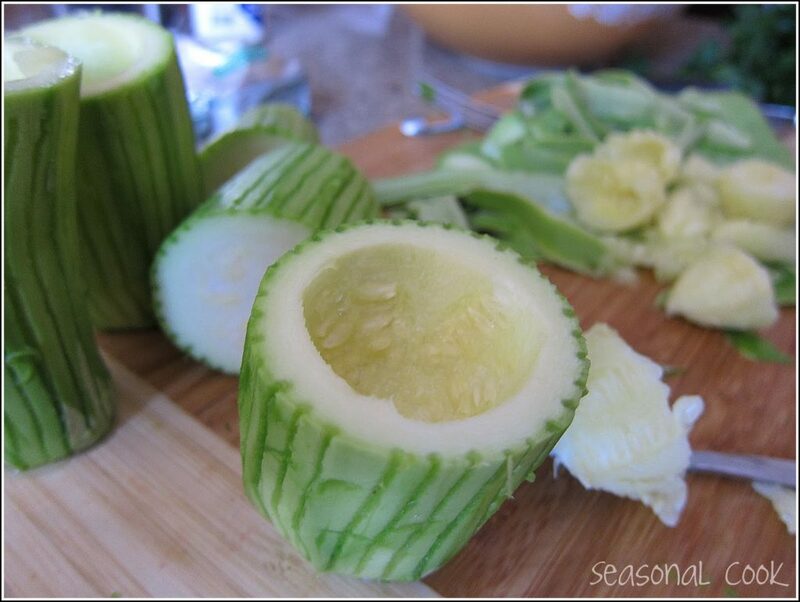 Using a fork, you can score a decorative pattern down the sides of the courgettes if you like. Do this before hollowing out. Don’t worry if the water boils over the tops of the dolma. This is fine. I definitely think that putting them in the oven for that final touch is worth it. This looks fantastic! I will definitely give it a try! Thanks for the inspiration. 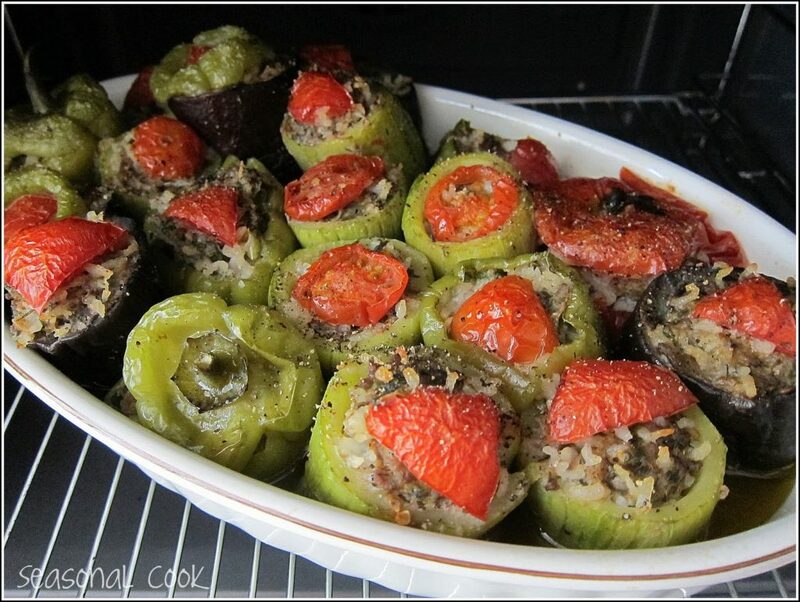 In Greece we call it "gemista" that is vegetables stuffed with rice and meat is optional.It is one of my favorite summer dishes!Yours look fantastic!When we say "dolma" we mean stuffed vine leaves with rice.Have a lovely evening,dear! 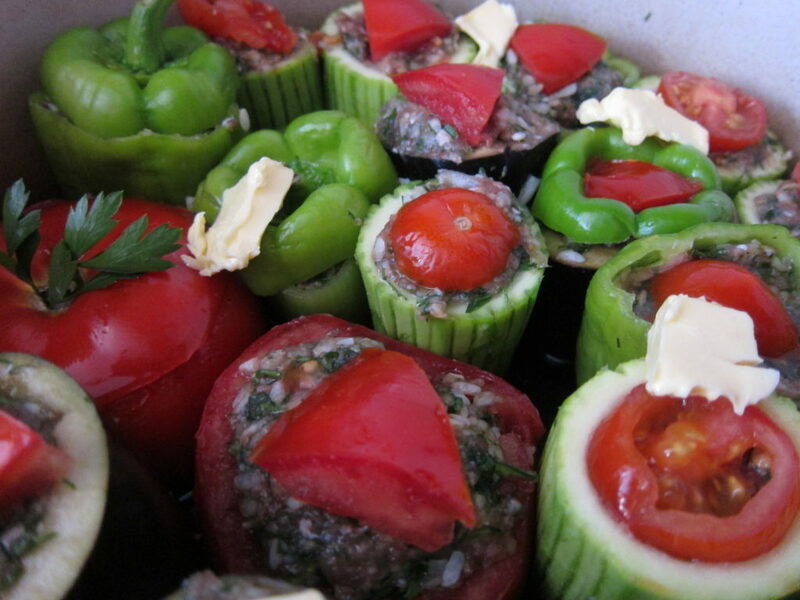 Your dolma ('gemista') look delicious! I've been think of making them for picnics when we go to the beach, but so far I've been too lazy. Your recipe has inspired me. Thank you very much! Look at that wonderful dolmas!! my childhood favorite! And a feast with a dollop of yoghurt:) Veg and dolmas look wonderful! Loved this post! Looks very tempting. Yes, dolma are delicious! Glad you all like them too. More onion is a good idea – if you like onion! And I always think it must be so easy to be a vegetarian in Turkey! I should have said that aubergines discolour almost immediately they are hollowed out and not to worry about that! These are my favourite kind of dishes Claudia. I love stuffed vegetables and dolmas!!! These look wonderful; in Provence they do similar things to vegetables. I have not had the patience to do all this work but your post inspires me to try.